We work with many property management businesses across Belfast and over the past two years have had the pleasure of working alongside Giant Property, one of the cities leading ones. From For Sale Signs to business cards, window vinyls to Mesh Banners, weâ€™ve become their go to guys for marketingâ€¦and rightly so. This week, we completed a design and print project for the team which included pretty much all of the above. Itâ€™s purpose was to bring their own branding / marketing to the net level and really set them apart from the other companies in Belfast. 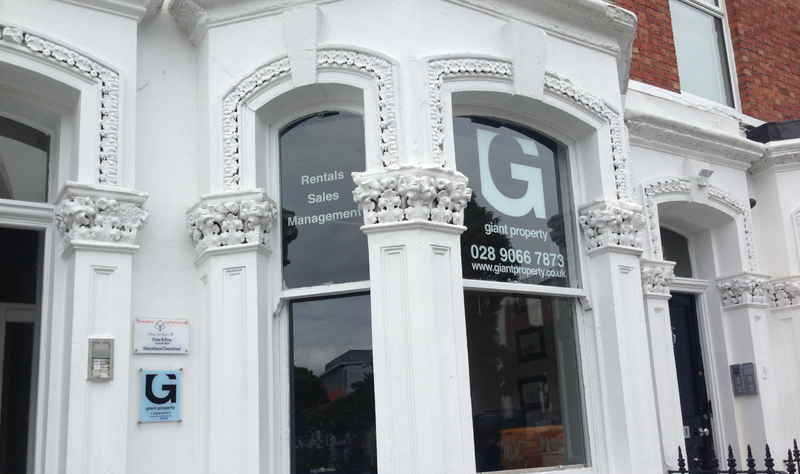 As you can see from the photo above, we installed some outward facing window graphics onto Giants own shopfront. Like ourselves, the company are keen to capitalise on both the inbound and outbound traffic the Lisburn Road has to offer. By making it easier for potential and existing customers to find you is a huge advantage over not having outdoor signage at your company. Another huge advantage to window graphics is the ability to showcase a brief list of your services to all who pass you premises. Since moving from a second floor office to a street side property with a shop front, Kaizen Print has a seen a huge surge in the number of new customers who have found us solely because they were driving past or saw our signage, thought it looked great and popped on in to have a chat (Always welcome by the way. Bring buns). As with Giant Property, the business has utilised their window space to show customers their range of services which include: - EPCâ€™s - Serviced Lets - Maintenance - Rentals - Sales - Management Even as a customer or supplier to Giant, people may not be aware of the full range of services they provide. When they see the graphics and if they have a suitable request, they can indeed open up a conversation with the team. The second part of Phase 1 of this project was to install a huge 10ft x 20ft Mesh Banner on the corner of University Street, Belfast. Focused primarily on generating new business, this banner is the start of a serious of marketing activities we have assisted Giant Property with. By taking a tongue in cheek approach to phrases used within the trade, we are lightening up a business section which is perceived as dull of stale by many. Not so with our clients I might add. 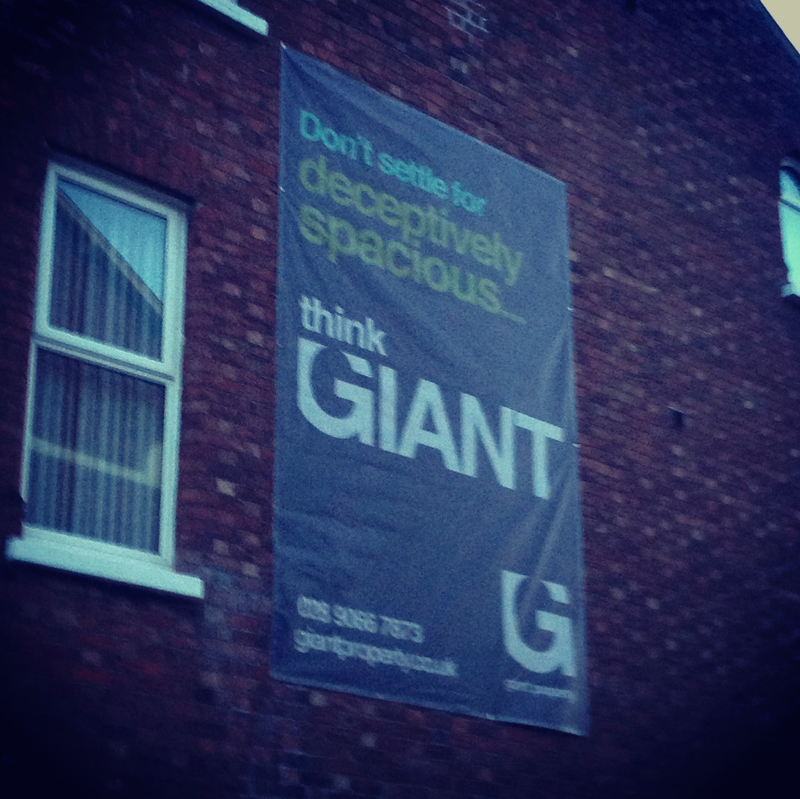 Donâ€™t settle for deceptively spacious, think GIANT Concept, Design, Print and Installation all carried out by our team. If you think your business could benefit from our services, we would love to chat to you. Just give us a call on 028 9002 2474 or email us via the contact form.